So I have unwrapped all my new cards and sorted them into colours. Now it is time to start building my new deck. Seeing as I had a hard time fighting off the spiders with my previous deck, my master-plan is to include a ‘Tactics’ hero in this deck. Tactics heroes can fight. There are four colours in The Lord of the Rings Card Game, each of which is called a ‘Sphere’. They are: Leadership (purple), Spirit (blue), Lore (green) and Tactics (red). Leadership has lots of resources to pay for stuff, Spirit is good at quests, Lore is good at healing and Tactics is good at fighting. One of the things I would like is to have a low starting ‘threat’ score. Low threat is good, high threat is bad. Your threat goes up turn by turn. With a low threat, you can avoid enemies. With a high threat, you get attacked a lot. Each of your three heroes has a threat score. Your starting threat is the total of your heroes scores. The lower this is, the more time you have before bad stuff happens. The starting threat for my previous deck was 32, which I think was far too high. I got attacked by everything before I had a chance to get ready. I definitely want a lower starting score this time. 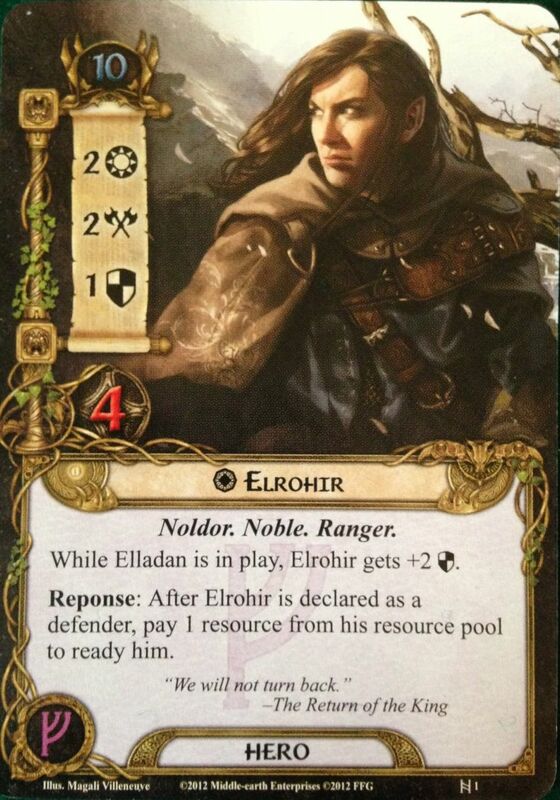 I also like heroes who can do more than one thing in a turn, so I am thinking of having the Elven twins, Elrohir and Elladan, as two of my heroes. They are leadership and tactics respectively and boost each other’s stats. They also have the ability to do a second thing in a turn. (Elrohir and Elladan are the twin sons of Elrond, and elder brothers to Arwen). They have threat scores of 10 each, which is better than Aragorn from my other deck who had 12. I now need to decide what sphere my third hero is going to be from. Lore would give me healing and drawing extra cards. Spirit is good for quests, and questing is how you progress through the scenarios. I like more of the cards in the Spirit sphere and I also think they have better flavour. 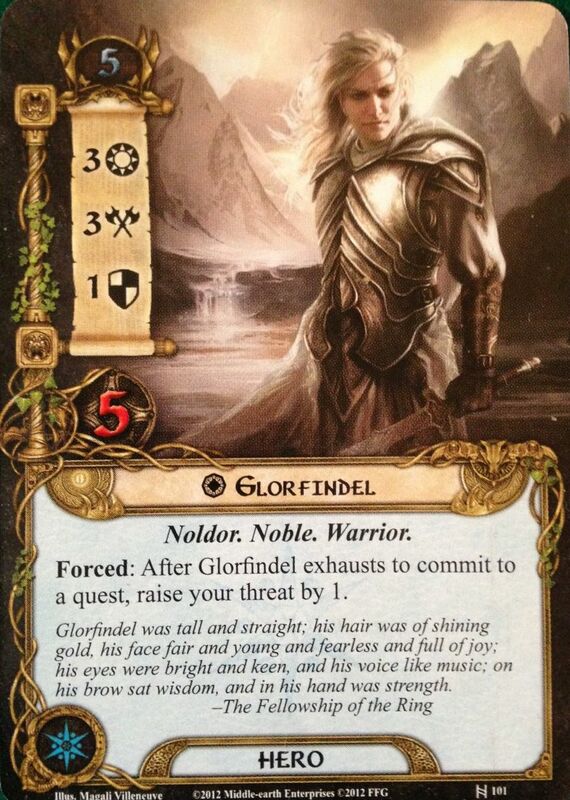 I will go with Spirit, and choose Glorfindel as the hero. He is another Elf and has a very low starting threat of 5. (In the books, Glorfindel was the Elf Lord who saved Frodo from the Nazgul outside Rivendell). This gives me a starting threat of 25, which I think is much more reasonable. Next I need to decide on the cards which are to go with these heroes. A deck has 50 cards, which doesn’t include your heroes. The deck supports your heroes who generally do most of the action. With three spheres, that will be about 16 cards each. You are allowed up to three copies of each card, so that’s probably about 5 or 6 specific cards from each sphere. I will want to include three copies of Gandalf, who is a great neutral card, so that sounds about right. So, what cards do I want? Each sphere has some key cards that are very very good and are considered to be ‘staples’ in that they are usually included in all decks containing that sphere. An example for leadership is Steward of Gondor. This gives your hero two extra resources each turn, which is awesome. For Spirit, there is Unexpected Courage. This allows your hero to take another action every turn. Which is awesome. For Lore, there is A Burning Brand. This allows your hero to cancel surprise bad cards during fights. Which is awesome. For Tactics, there is Feint. This stops an enemy attacking for an entire turn. Which is awesome. The thing is, without a Lore hero I will be missing out on a lot of good Lore cards which provide healing and card draw, two of Lore’s strengths. I should probably try and include some cards that fill this gap in some way. I’ll have a look and see what I can find. 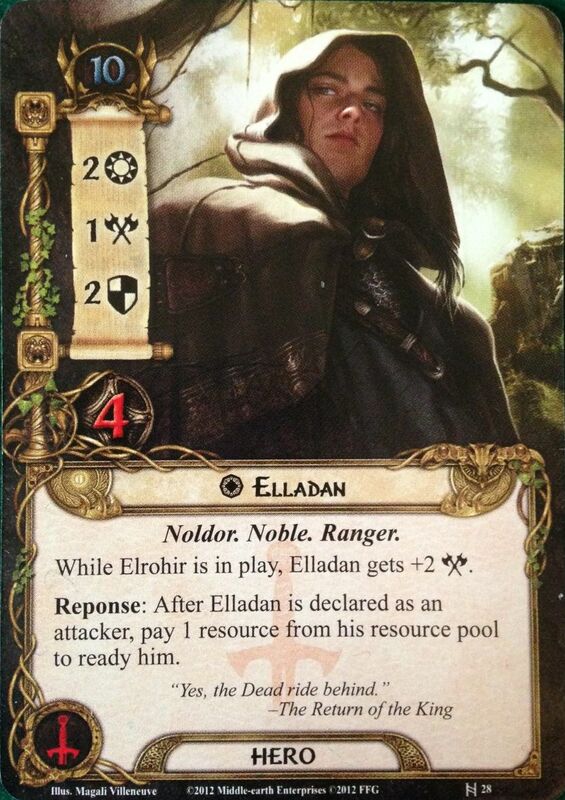 Posted in Blog Posts and tagged lcg, LOTR LCG, The Lord of the Rings Card Game on August 3, 2014 by Tim.